White Clearcoat 2018 Fiat 500X Trekking AWD 9-Speed 948TE Automatic 2.4L I4 Vehicle is equipped with: Quick Order Package 28G, 17" x 7.0" Aluminum Wheels, 3.734 Axle Ratio, 4-Wheel Disc Brakes, 6 Speakers, 7.0" Touch Screen Display, ABS brakes, Air Conditioning, Alloy wheels, AM/FM radio: SiriusXM, Anti-whiplash front head restraints, Apple CarPlay, Brake assist, Bumpers: body-color, Compass, Delay-off headlights, Driver door bin, Driver vanity mirror, Dual front impact airbags, Dual front side impact airbags, Electronic Stability Control, Four wheel independent suspension, Front anti-roll bar, Front Bucket Seats, Front Center Armrest, Front fog lights, Front reading lights, Fully automatic headlights, Google Android Auto, GPS Antenna Input, Heated door mirrors, Illuminated entry, Knee airbag, Leather steering wheel, Low tire pressure warning, Occupant sensing airbag, Outside temperature display, Overhead airbag, Overhead console, Passenger door bin, Passenger vanity mirror, Power door mirrors, Power steering, Power windows, Premium audio system: Uconnect 4, Premium Cloth Bucket Seats, Radio data system, Radio: Uconnect 4 w/7" Display, Rear anti-roll bar, Rear window defroster, Rear window wiper, Remote keyless entry, Security system, Speed control, Speed-sensing steering, Split folding rear seat, Spoiler, Steering wheel mounted audio controls, Tachometer, Telescoping steering wheel, Tilt steering wheel, Traction control, Trip computer, Turn signal indicator mirrors, USB Host Flip, and Variably intermittent wipers. 21/29 City/Highway MPG At Peake Chrysler Dodge Jeep Ram FIAT we believe that success is a satisfied customer, and profit is a by-product of hard work. Nero Noctis Black 2018 Fiat 500X Trekking AWD 9-Speed 948TE Automatic 2.4L I4 Vehicle is equipped with: Cold Weather Package (Heated Front Seats, Heated Steering Wheel, and Windshield Wiper De-Icer), Quick Order Package 28S Urbana Edition (Black Door Handles, Black Exterior Accents, Black Instrument Panel Bezels, Black Interior Accents, Black Side Roof Rails, Body Color Fascias, Premium Cloth Low-Back Bucket Seats, Urbana Edition, and Wheels: 18" x 7" Black Aluminum w/Copper Accents), 3.734 Axle Ratio, 4-Wheel Disc Brakes, 6 Speakers, 7.0" Touch Screen Display, ABS brakes, Air Conditioning, Alloy wheels, AM/FM radio: SiriusXM, Anti-whiplash front head restraints, Apple CarPlay, Brake assist, Bumpers: body-color, Compass, Delay-off headlights, Driver door bin, Driver vanity mirror, Dual front impact airbags, Dual front side impact airbags, Electronic Stability Control, Four wheel independent suspension, Front anti-roll bar, Front Bucket Seats, Front Center Armrest, Front fog lights, Front reading lights, Fully automatic headlights, Google Android Auto, GPS Antenna Input, GPS Navigation, Heated door mirrors, Illuminated entry, Knee airbag, Leather steering wheel, Low tire pressure warning, Occupant sensing airbag, Outside temperature display, Overhead airbag, Overhead console, Passenger door bin, Passenger vanity mirror, Power door mirrors, Power steering, Power windows, Premium audio system: Uconnect 4, Premium Cloth Bucket Seats, Radio data system, Radio: Uconnect 4 Nav w/7" Display, Radio: Uconnect 4 w/7" Display, Rear anti-roll bar, Rear window defroster, Rear window wiper, Remote keyless entry, Security system, Speed control, Speed-sensing steering, Split folding rear seat, Spoiler, Steering wheel mounted audio controls, Tachometer, Telescoping steering wheel, Tilt steering wheel, Traction control, Trip computer, Turn signal indicator mirrors, USB Host Flip, and Variably intermittent wipers. 21/29 City/Highway MPG At Peake Chrysler Dodge Jeep Ram FIAT we believe that success is a satisfied customer, and profit is a by-product of hard work. Green Metallic 2019 Fiat 500X Trekking AWD 9-Speed 948TE Automatic 1.3L I4 Vehicle is equipped with: Cold Weather Group (Heated Front Seats and Windshield Wiper De-Icer), Quick Order Package 22G, 3.734 Axle Ratio, 4-Wheel Disc Brakes, 6 Speakers, 7.0" Touch Screen Display, ABS brakes, Air Conditioning, AM/FM radio: SiriusXM, Anti-whiplash front head restraints, Brake assist, Bumpers: body-color, Cloth Low-Back Bucket Seats, Compass, Delay-off headlights, Driver door bin, Driver vanity mirror, Dual front impact airbags, Dual front side impact airbags, Electronic Stability Control, Four wheel independent suspension, Front anti-roll bar, Front Bucket Seats, Front Center Armrest, Front fog lights, Front reading lights, Fully automatic headlights, Heated door mirrors, Illuminated entry, Integrated Voice Command w/Bluetooth, Knee airbag, Leather steering wheel, Low tire pressure warning, Occupant sensing airbag, Outside temperature display, Overhead airbag, Overhead console, Passenger door bin, Passenger vanity mirror, Power door mirrors, Power steering, Power windows, Premium audio system: Uconnect 4, Radio data system, Radio: Uconnect 4 w/7" Display, Rear anti-roll bar, Rear window defroster, Rear window wiper, Remote keyless entry, Security system, Speed control, Speed-sensing steering, Split folding rear seat, Spoiler, Steering wheel mounted audio controls, Tachometer, Telescoping steering wheel, Tilt steering wheel, Traction control, Trip computer, Turn signal indicator mirrors, USB Host Flip, Variably intermittent wipers, and Wheels: 17" x 7.0" Silver Aluminum. Recent Arrival! 24/30 City/Highway MPG At Peake Chrysler Dodge Jeep Ram FIAT we believe that success is a satisfied customer, and profit is a by-product of hard work. Blue 2019 Fiat 500X Trekking AWD 9-Speed 948TE Automatic 1.3L I4 Vehicle is equipped with: Cold Weather Group (Heated Front Seats and Windshield Wiper De-Icer), Quick Order Package 22G, 3.734 Axle Ratio, 4-Wheel Disc Brakes, 6 Speakers, 7.0" Touch Screen Display, ABS brakes, Air Conditioning, AM/FM radio: SiriusXM, Anti-whiplash front head restraints, Brake assist, Bumpers: body-color, Cloth Low-Back Bucket Seats, Compass, Delay-off headlights, Driver door bin, Driver vanity mirror, Dual front impact airbags, Dual front side impact airbags, Electronic Stability Control, Four wheel independent suspension, Front anti-roll bar, Front Bucket Seats, Front Center Armrest, Front fog lights, Front reading lights, Fully automatic headlights, Heated door mirrors, Illuminated entry, Integrated Voice Command w/Bluetooth, Knee airbag, Leather steering wheel, Low tire pressure warning, Occupant sensing airbag, Outside temperature display, Overhead airbag, Overhead console, Passenger door bin, Passenger vanity mirror, Power door mirrors, Power steering, Power windows, Premium audio system: Uconnect 4, Radio data system, Radio: Uconnect 4 w/7" Display, Rear anti-roll bar, Rear window defroster, Rear window wiper, Remote keyless entry, Security system, Speed control, Speed-sensing steering, Split folding rear seat, Spoiler, Steering wheel mounted audio controls, Tachometer, Telescoping steering wheel, Tilt steering wheel, Traction control, Trip computer, Turn signal indicator mirrors, USB Host Flip, Variably intermittent wipers, and Wheels: 17" x 7.0" Silver Aluminum. Recent Arrival! 24/30 City/Highway MPG At Peake Chrysler Dodge Jeep Ram FIAT we believe that success is a satisfied customer, and profit is a by-product of hard work. Blue Metallic 2019 Fiat 500X Trekking AWD 9-Speed 948TE Automatic 1.3L I4 Vehicle is equipped with: Quick Order Package 22G, 3.734 Axle Ratio, 4-Wheel Disc Brakes, 6 Speakers, 7.0" Touch Screen Display, ABS brakes, Air Conditioning, AM/FM radio: SiriusXM, Anti-whiplash front head restraints, Brake assist, Bumpers: body-color, Cloth Low-Back Bucket Seats, Compass, Delay-off headlights, Driver door bin, Driver Seat Back Pocket, Driver vanity mirror, Dual front impact airbags, Dual front side impact airbags, Electronic Stability Control, Four wheel independent suspension, Front anti-roll bar, Front Bucket Seats, Front Center Armrest, Front fog lights, Front reading lights, Fully automatic headlights, GPS Navigation, Heated door mirrors, Illuminated entry, Integrated Voice Command w/Bluetooth, Knee airbag, Leather steering wheel, Leather Trimmed Bucket Seats, Low tire pressure warning, Occupant sensing airbag, Outside temperature display, Overhead airbag, Overhead console, Passenger door bin, Passenger vanity mirror, Power door mirrors, Power steering, Power windows, Premium audio system: Uconnect 4, Radio data system, Radio: Uconnect 4 Nav w/7" Display, Radio: Uconnect 4 w/7" Display, Rear anti-roll bar, Rear window defroster, Rear window wiper, Remote keyless entry, Security system, Speed control, Speed-sensing steering, Split folding rear seat, Spoiler, Steering wheel mounted audio controls, Tachometer, Telescoping steering wheel, Tilt steering wheel, Traction control, Trip computer, Turn signal indicator mirrors, USB Host Flip, Variably intermittent wipers, Vinyl Door Trim Panel, and Wheels: 17" x 7.0" Silver Aluminum. Recent Arrival! 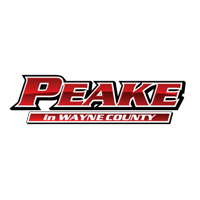 24/30 City/Highway MPG At Peake Chrysler Dodge Jeep Ram FIAT we believe that success is a satisfied customer, and profit is a by-product of hard work.